The story of how we built a location-independent business goes back to when Pete and I first met. We were working cushy corporate jobs - great salaries, benefits, company car, paid travel - and we were completely unfulfilled. We learned really quickly that you couldn’t pay us enough to do what we hated, and that more money and more worldly “success” wasn’t our top priority. We were surrounded by people who were chasing more money, more promotions, nicer cars, better apartments, and lots and lots of more stuff. And honestly, we just didn’t feel like we fit in. We wanted more out of our life - and that “more” wasn’t anything we could buy. At the time, we started a blog called Quarter for Your Crisis to document our travels, experience, and stories of those we met along the way. We had no monetization plan, no marketing strategy, and no income. We had simply saved up money for the previous few years to be able to go on this grand adventure. That backpacking experience was the first time we ever met or saw people who were making money and building businesses on the road. It opened our eyes to the world of digital nomads and planted a seed to start something of our own. Most likely, if you’re reading this blog, you may be feeling the same way about RV life. There are so many incredible people and families who are full-time RVing and making it work in a million different ways. Today, I want to share how we were able to grow our business idea into a company that now supports our full-time RV life. Once we returned to America, we had severe reverse-culture shock. We knew we didn’t want to go back to New York City, and we weren’t ready to dive into another corporate job. We figured we had already taken this huge plunge in leaving our jobs, so why not try to make this whole entrepreneur-thing work? I still joke to Pete that our business is an experiment gone right - and here’s why. The summer that we returned, we were living on a small 7-mile island full of mom and pop shops. These businesses made almost all of their money in the summertime from tourists, and yet very few of them had websites or any social media presence. We decided we’d start building websites to support the small businesses in our town, and we started a Google sheet of those businesses who could potentially need our services. Once that list reached over 50 businesses, we threw up our own website, printed out some flyers at the local library, and started knocking door to door. We simply showed up, introduced ourselves to business owners, and asked how we could get them online - and some of those folks took a chance on us two crazy kids. Since that first summer, our business has grown almost completely by word of mouth and referrals. We’ve been blessed to serve some incredible clients - but we also learned a ton about what we didn’t want to do in our business. That first year in business, we said “Yes” to everything that came our way. We were hungry to grow and learn, and we pretty much taught ourselves anything we didn’t know. We quickly learned what we loved to do - and what we didn’t. And while all of those experiences were an important part of our journey, if I could encourage you to do anything in your entrepreneurial endeavor it’s this: NICHE. Know exactly WHO you want to serve, HOW you want to serve them, and WHY you’re the best one to serve them. Almost four years since we first started our business, and we’ve finally found our niche and expertise. We help wedding professionals and creative entrepreneurs build purpose-driven lives + businesses (you can learn more here!). We still take on a limited number of web design projects, because I genuinely enjoy that piece of our business, but we mainly focus on marketing strategy, and even more specifically, Facebook and Instagram ads. It’s our jam, and we totally love helping our clients grow their businesses online! When we started our business, we served mainly local business owners. Once we decided that we’d be going full-time in an RV after our wedding (aka once Pete convinced me that I would love it… he was right), we knew we needed to make some changes in our business model. We started off boarding some of our local clients and working with clients across the country. We hosted less in-person meetings and started setting expectations that we’d talk over Skype, Zoom, etc. Setting those expectations with our clients really helped with the transition on the road. We also started putting better systems in place in our business and narrowing down on our services even more. We found that packaging our services in specific ways helped us not only attract our ideal clients better, but it gave us the confidence to close more of our inquiry calls. Living in an RV has completely transformed our lives and businesses. As scary of a move as it can feel like, it was honestly one of the best chances we’ve ever took on ourselves and our business. RV life has grown us in our marriage, our faith, our business, and in ourselves. In our business specifically, it’s made us take a hard look at the different parts of what we do and really focus in on what serves us and our clients best. It’s also hard not to be constantly motivated when all you have to do is look outside your window to be reminded of why you chose this lifestyle! Most days, we start with a slow morning routine. We’ll wake up between 6-6:30, and we’ll spend 30-60 minutes praying and doing our devotionals. We’ll make breakfast, and take Russ for a walk or to the dog park for about an hour before we get started with our work day. We’ll usually take another break mid-day to make lunch and walk with Russ, and another in the evening to take Russ to the park and workout. Most nights, we’re grilling, doing some work, and ending the night with a good book! RV life means that we get to have a super flexible schedule with our work and lifestyle. The biggest thing we have to consider is timezone and how it will affect our client meetings. We use Calendly to schedule our calls, which integrates directly with our iCalendar and automatically updates for which time zone we are in - huge win! In Park City, we actually hosted a live webinar from the study room at the local library - and it worked perfectly! The only other obstacles with running a business so nomadically that we’ve been working hard to prevent are managing client expectations and payments. For expectations, we work hard to develop great relationships with our clients. We use Voxer to stay in contact for our coaching clients, and we always make sure our clients know about our lifestyle. We try not to be on the move if we have client calls, which means we try our best to block schedule out our call and coaching days. For payments, we use Wave Apps for invoicing, and Honeybook for our CRM, both of which allow for online payments which makes it super easy for ourselves and our clients. We do have some clients pay us through PayPal as well. There are definitely a few things that need to change about your business when you hit the road, but if you prepare a little ahead of time, set up the right expectations with your clients and coworkers, it can be a pretty seamless transition! Hi! We’re Lyndon and Chelsea Miller, and we live in a 18 ft. vintage camper named Norma. After getting married in 2015 we decided we wanted to travel the world and get a new perspective on life, so we quit our jobs, sold our stuff, rented our house out and bought our Norma. That was two and half years ago and it feels like we’re just getting started! We’ve done many things on the road to make a quick buck, but one of our favorites is camp hosting! We are forever indebted to our cousins for finding us this sweet gig. They met a couple our age that was camp hosting in their hometown and helped us get involved. Since then I have signed up for www.workingcouples.com to check out other campgrounds offering camp host positions, as well as www.coolworks.com. Our current position as a camp host is with a campground that is very seasonal from late May to early September. We are located at 10,000 ft. in the Rocky Mountains, so we wake up to crisp mornings-and in the early season sometimes snow! We get quite a few wildlife sightings such as bears, moose, deer, and big horned sheep. The campground we help care for is composed of 25 sites and 5 pit bathrooms with no electric, water hookups, and limited cell service. Needless to say, it’s pretty remote. There’s a large lake in front loaded with trout and the view is gorgeous. With this setup, we get paid minimum wage for 80 hours a week between the two of us and a free place to park with water and sewer. We calculated that we probably work 10-15 hours of physical labor a week, which generally means cleaning the sites and restrooms and completing paperwork. We try and take Monday and Tuesday completely off to explore our area, and simply keep things maintained around camp during the week. Weekends sometimes bring the occasional responsibility to solve a problem for a guest or answer some questions that may happen at any time-day or night. This kind of work involves people skills for sure. There’s a fine line between knowing when to let an issue go and when to address it. For example, some issues may seem minor to a guest, but can pose a real threat to our campground, like leaving trash out or hanging hummingbird feeders that attract bears. Another time when we may have to intervene with our guests may be if a camper takes someone else's campsite on accident, and then we have to be the one to tell them that they have to move their RV. Delivering those kind of messages to guests is never fun and is why it's essential that camp hosts know how to work well with people. And at the same time, camp hosts need to know how to let people have a fun and an enjoyable camping experience. We have to discern what is important for safety and the experience of others and what is a minor issue that won't truly impact anyone else. We often hear from many campers how young we are, and it seems that the majority of camp hosts are older and retired. However, we always wonder why more people our age don’t do this! Every campground is different but if you love the outdoors, want a place to park your RV for free, and possibly get paid to work right where you are, why not? It takes patience, people skills, getting your hands dirty, and the occasional late night wake up call from campers or wildlife, but as Lyn always says, the reward is hard to beat! Follow Lyn and Chelsea on Instagram. Photos above are property of Tessa Woodcock. If there's one aspect of full-timing as a novice that I found most overwhelming it was the actual cost. There was such a mystery to it. Campground membership websites are often confusing and vague. When I talked to others it seemed like they were spending a fortune doing this full-time, and I was determined to find a cheaper way to stay at nice, safe parks without doing month-long stays. 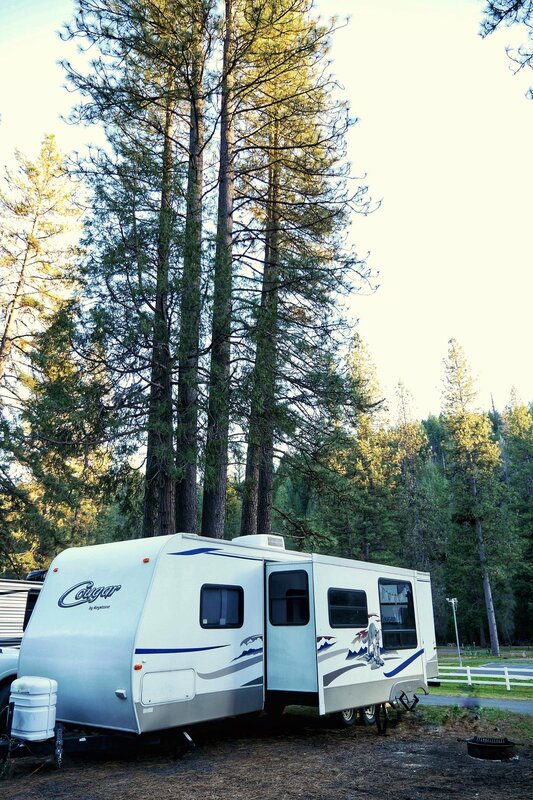 So after a few months of experimenting with different campground memberships, we finally found a system that averages out to $200/month at campgrounds with ample amenities and security AND in areas around the country that we actually wanted to visit. This was the first campground membership we invested in. Map taken from Resortparks.com showing the campgrounds available within the membership. Resort Parks International (RPI) is not open to the general public. You must first be a member of an RPI park. The prices of these parks vary by park, but it doesn't matter which one you join. I would recommend that if you don't have a preference on where you want your home park to be, call various RPI parks to price the cheapest one to join. Our home park is in Branson, Missouri, at Treasure Lake Resort. This is a resort that other family members have and is close to our home state of Arkansas. It's also a really nice park. Much like you can purchase second-hand condo timeshares, you can buy a second-hand membership to an RPI park, as well. We purchased ours off an individual for $700. That gets us a membership for life with annual dues of $180. If we would have purchased the membership through the park, it would have been $2700. So definitely look on Facebook groups, Craigslist, and directly through the park to see if there others out there looking to sell their membership to a park. And as I mentioned before, I have seen some RPI parks as cheap as $500 to join, so check around. This has a pretty comprehensive list of RPI parks, but it may be out of date, so call to check. In addition to the one-time membership to a home park, you will have an annual RPI membership of $200 to access nationwide RPI parks. So what does RPI get you? I now have access to all the green and yellow parks on the map above for just $10/night. I can't spend more than 21 nights at one park (unless you have a long-term rental agreement with the park), but I CAN leave one RPI park at 21 days and hop into another RPI park. You don't have to go out of network ever. We never stay anywhere for more than a week or two at a time, so the 21 day rule hasn't been hard. You also get the brown parks on the map at $15/night in the off-season and 30% off in peak season. These are TT/Encore parks and each park determines their own peak and off-season. For example, summer isn't peak for most Florida parks, but summer is peak season at most Northeast parks. Ok, are you still with me? So far we have an investment of $700 for our "home" park for life ($180 annually for dues until we die) and $200 annually for the actual nationwide RPI membership. Now, with just this membership, you could realistically stay $10/night all over the country with some $15/night stops at Encore/Thousand Trail parks in their off-season. That would be $300/month or $3600 for the year plus the initial investment of $900 (home park + RPI membership). That's a total of $4520 for the year or $375/month average. That's great, right? A lot cheaper than my $1400 mortgage plus $500 utility bill in my sticks and bricks. And a lot cheaper than paying $50/night at most campgrounds! But we can do BETTER and get MORE options! Now, remember how I said with your RPI membership you get $15/night during off-season at some Encore/Thousand Trails parks? That's all well and good IN THE OFF-SEASON. When it's peak season, these particular parks are only 30% off, and depending on the park that could mean you are paying $35-$50/night. Nope, that won't do. This is when a Thousand Trails Zone pass makes sense. You can read more about this pass in a previous blog post here. But basically, for $425 annually you can get access to regional areas of TT parks at no additional nightly cost. We purchased the Northeast zone pass because most of the parks int he Northeast we wanted within our RPI membership were Encore/TT, and it was peak season. But with the Thousand Trails Zone Pass, we can stay at each Thousand Trail park for up to 14 days for no additional cost, and then we have to stay completely out of network for 7 days before returning to a Thousand Trail park. Those 7 days are when we cash in on our RPI membership. Do you see what I just did? Are you still with me? There really isn't one. The parks we have stayed at vary in quality. Some are very well-maintained. Others could use a bathroom remodel or a little TLC on the mini golf holes. But all are safe and clean with amenities like pools, playgrounds, hot tubs, clubhouses, farm animals, activities, restaurants, country stories, and more. Most have 24/7 security or gates with code access. Some have big, wooded lots, and some are more like parking lots. I'm careful to read reviews when we are planning to check on quality, internet reception, and lot size. A lot of the parks may not be exactly where you want, too. We often are an hour or so drive from trips we want to take. For example, this week we are in Front Royal, Virginia, and it's an hour from D.C., but we don't mind driving to see the city when we are saving considerably at our campground. But then other times, like when we stayed near Yosemite, Las Vegas, or Mammoth Cave, we were in the best location for what we wanted to see! But the reality is when you only spend $200/month on average at campgrounds, you can splurge on a $50/night site every now and then if there is a park you really want to visit. These memberships, though, help us save money and make this lifestyle accessible to more people. And if we can help others with our experience, we certainly want to! If you have any more questions, don't hesitate to shoot me an email at ouradventurediaryblog@gmail.com or message me through Instagram at @thosebyrnesgirls .